Frame die-cast aluminium in different lacquer colours. Seat and back coloured mesh. The lightweight and comfortable stacking chair Bigframe from the Frame collection of Alberto Meda is also available in an outdoor version suitable for garden, pool and patio. Available with or without arms, the chair does not differ in design and quality of the chair version Bigframe for indoor use. 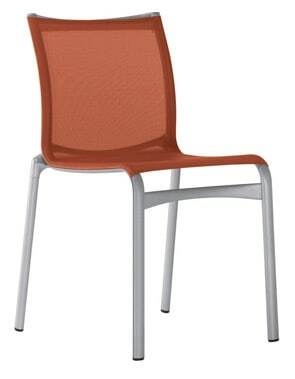 The frame is made of die-cast aluminium, seat and backrest are in fire retardant PVC covered polyester mesh. Frame and mesh are available in a lot of colours and finishes. Do you have a question about "Bigframe Outdoor"? How can we contact you?